Researchers at the U.S. Department of Energy’s Lawrence Berkeley National Laboratory (Berkeley Lab) and the Joint Center for Artificial Photosynthesis (JCAP), a DOE Energy Innovation Hub, have come up with a new recipe for renewable fuels that could bypass the limitations in current materials: an artificial photosynthesis device called a “hybrid photoelectrochemical and voltaic (HPEV) cell” that turns sunlight and water into not just one, but two types of energy – hydrogen fuel and electricity. The paper describing this work was published on October 29 in Nature Materials. Most water-splitting devices are made of a stack of light-absorbing materials. Each layer absorbs different parts or “wavelengths” of the solar spectrum, ranging from less-energetic wavelengths of infrared light to more-energetic wavelengths of visible or ultraviolet light. After running a simulation to predict whether the HPEC would function as designed, they made a prototype to test their theory. “And to our surprise, it worked!” Segev said. 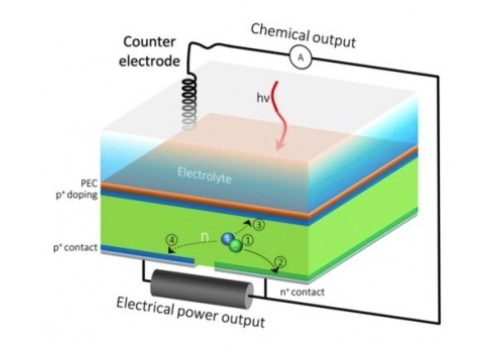 According to their calculations, a conventional solar hydrogen generator based on a combination of bismuth vanadate and silicon will utilize only 6.8 percent of the solar energy striking the cell and store it the form of hydrogen fuel. All the rest is lost. In contrast, the HPEV cells harvest leftover electrons that do not contribute to fuel generation. These residual electrons are used to generate electrical power, resulting in a dramatic increase in the overall solar energy conversion efficiency. For example, according to the same calculations, the same 6.8 percent of the solar energy can be stored as hydrogen fuel in an HPEV cell made of bismuth vanadate and silicon, and another 13.4 percent of the solar energy can be converted to electricity. This enables a combined efficiency of 20.2 percent, three times better than conventional solar hydrogen cells.